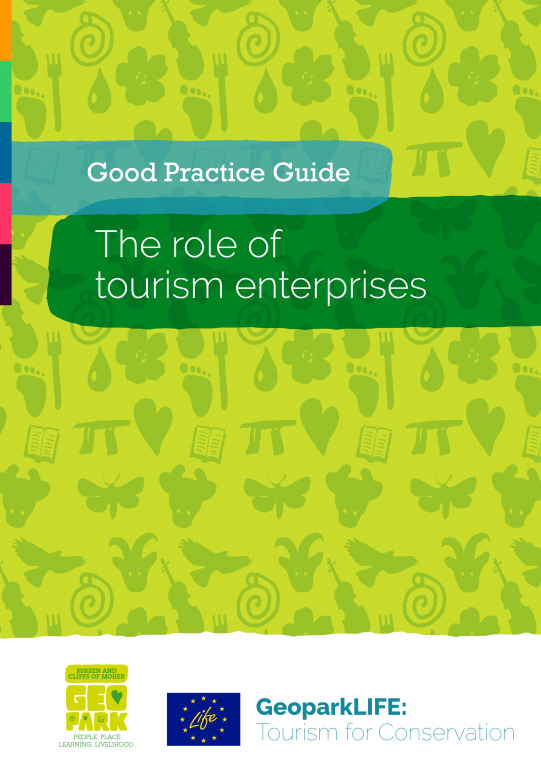 The Code of Practice for Sustainable Tourism toolkit is contained in an online system that can be adapted to the needs of different destinations. The Code comprises 6 core principles. Each principle is broken down into a number of performance measures i.e. actions a business can take in order to implement this principle. While enterprises are not required to implement all performance measures from the outset, they are encouraged to work towards them all over time. All performance measures can be determined by the destination managers and tailored to the specific needs of their territory. They are framed within the elements of effective sustainable tourism practice defined by GSTC and ETIS. Click here to view the Code of Practice master file for the Burren & Cliffs of Moher Geopark. To ensure ease of understanding and engagement, this table of measures is re-written in layman’s language as a series of actions that an enterprise can take in order to comply with the Code. A simple Self Assessment Checklist enables the enterprise to scan the list of actions, readily understand what is being asked of them and assess their current performance against the Code. Click here for the self assessment master file for the Burren & Cliffs of Moher Geopark or select the online Self Assessment Tool on the left navigation bar. Once a Self Assessment has been completed, the system will generate a To Do List, tailored to the individual enterprise. The To Do List comprise all actions (measures) which the enterprise is not currently implementing. It will also point the enterprise towards resources that will enable it to implement these measures e.g. guidelines, templates, case studies, reference material. Click here for a sample To Do List for an enterprise in the Burren & Cliffs of Moher Geopark. The first step in adopting the Code is that the tourism enterprise measures and monitors the use of resources – waste, water, energy. The monthly data is keyed into the system along with the number of visitors they host month-by-month. This generates a resource usage benchmark for each enterprise which they can track over time. The system also aggregates the total resource usage or consumption for all businesses using the system. This can be used to monitor and track group/destination performance over time. The second step is that each tourism enterprise must compile and document evidence of implementation of all measures. This is the process used by all certifying bodies and so introduces a discipline of filing and reporting that will stand the enterprise in good stead as they progress on their journey to sustainability. The system enables a tourism operator to upload and document evidence for each action (measure). Businesses are supported by video tutorials, downloadable guides and links to external resources. The system generates an indicative score and overall performance band rating. The final submission is then desk-reviewed on the system by an independent evaluator who provides qualitative feedback to the enterprise and assesses whether the evidence provided is sufficient to support the score. On-site verification visits of a representative random sample of the tourism enterprises are recommended. The purpose of the visits is to verify that the evidence submitted and claims made in the Code of Practice submission are reflected in the delivery of the visitor experience. The objective is to establish the integrity and credibility of the system as a standard for sustainable tourism practice in the region.